As pollination is finishing throughout the North Dakota corn growing region, we can now make the first estimate of the grain yield potential of a field since the number of ears and number of kernels per ear can be fairly accurately estimated. The only yield component that requires some guess work is kernel size. Of course this whole exercise depends on reasonable growing conditions for the remainder of the season. The process for estimating yield that we describe here is widely used and is proposed due to its simplicity. Ears per acre – The first step is to determine the number of ears per acre. To do this, count the number of ears that will likely produce an ear at harvest within the length of a row that represents one thousandth of an acre (17.5 feet for 30 inch rows or 23.75 feet for 22 inch rows). Only count the ears that will likely contribute to yield at harvest. Late silking ears on runted plants and ears on tillers should not be counted. In situations where there are multiple ears on a single plant, avoid including the second and third ears unless you feel comfortable in estimating their potential contribution to overall yield. Kernels per ear – to get a good estimate of the number of kernels per ear, count the number of rows and the number of kernels per row from about every five ears in the row that you count to determine ear numbers. Multiply the number of rows by the number of kernels in a row omitting the bottom most kernel and any kernels that did not get fertilized in the tip of the ear. As grain filling progresses, kernels that obviously are not filling did not get fertilized or may have aborted due to stress after fertilization. 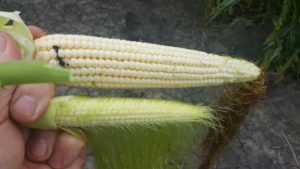 The kernels on the uppermost portion of the ear in the photo below have not yet been fertilized (silks still attached) and at this point should not be included in the kernel count. Take an average of the kernel numbers per ear for all of the ears that were counted. Kernel weight divisor – The final factor, which is the least known at this point is a factor that estimates seed size. From trials we conducted last year, we propose a kernel weight divisor of 90 (about 280 gms per 1000 kernels). Smaller divisors can be used if you expect kernel size to be larger (using a hybrid that produces large kernels and/or to estimate conditions of exceptionally good grain fill). An example – if within a 17.5 ft length (assuming a 30 inch spacing) you count an average of 30 ears and the five ears which were counted for kernels had 400, 350, 375, 290, and 380 kernels (average = 359 kernels) then the estimated yield would be (30 x 359)/90 = 120 bu per acre. The silks become detached from kernels soon after fertilization. There has been no fertilization in the ear at the bottom as the silks have just recently emerged. Only the kernels closest to the tip have not been fertilized in the top ear. The silks arising from the upper most ovules are the last to emerge and therefore the last to be fertilized. This form of yield estimation is just an estimate. Check it with your yield monitor and grain cart scales at the end of a field to see how far you were off. It is naturally very hard to capture whole field variability with an estimation using only a small part of a given field.